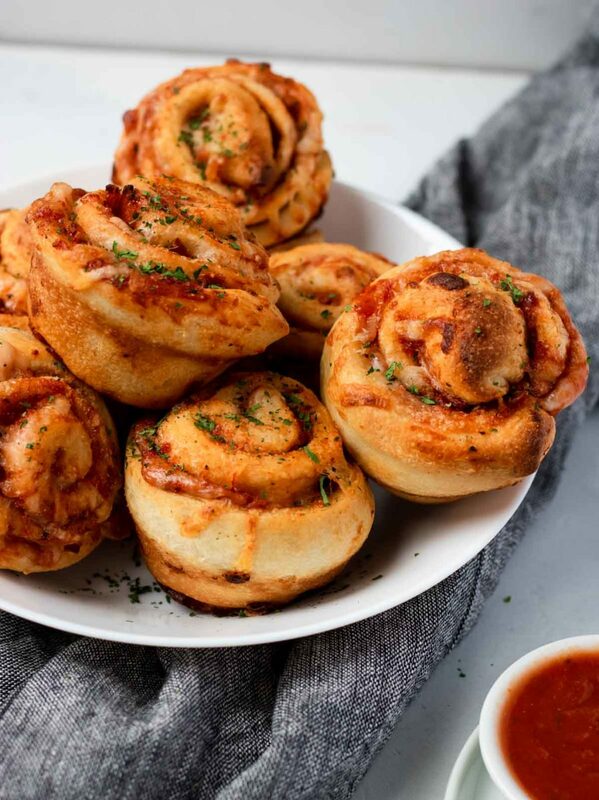 Pizza Roll Ups are like a piece of pizza all rolled up in a delicious little bundle. They are full of tomato sauce, ooey-gooey cheese, and, in my recipe, turkey pepperoni. They are completely kid friendly, make an easy weeknight dinner, kids school lunch, or after school snack. Aren’t we all in search of dinner ideas and sack lunch ideas that our kids won’t cry or complain about? 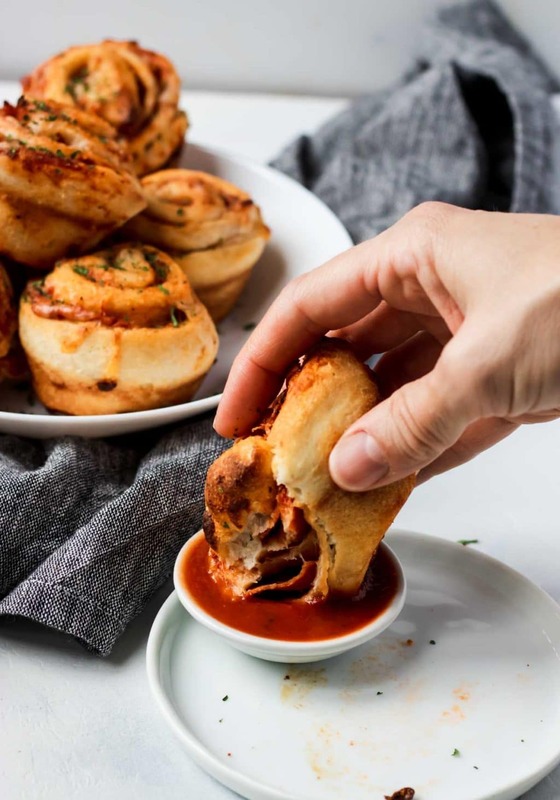 This recipe for Pizza Roll Ups is going to be your new go-to kid friendly dinner (that you will want to eat too!). They taste like take-out pizza, but made at home. Pair these with a salad and you have a dinner that is done from start to finish in less than 30 minutes! 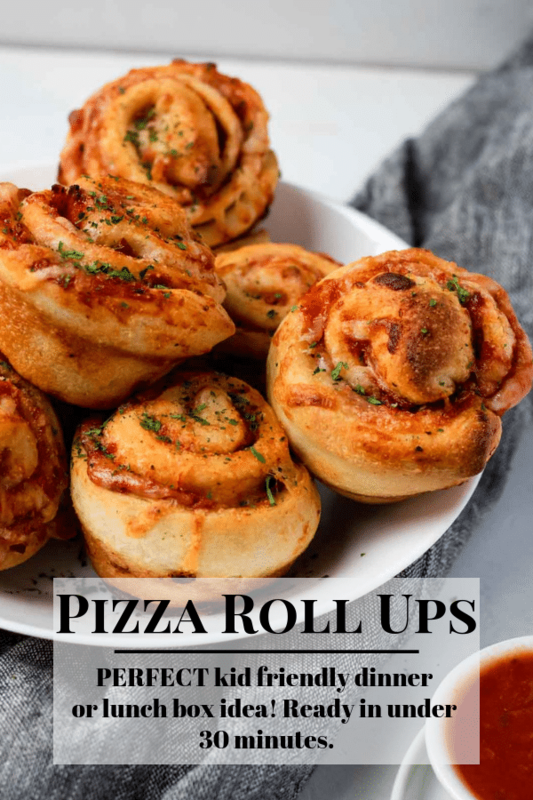 It is so easy to make Pizza Roll Ups, just a few steps, a few ingredients, and they are done! Unroll the pizza dough and use a rolling pin to make the dough about 14×12, that way you will be able to cut 8 even strips from the dough. Now cut each pepperoni into 4 pieces. It’s easiest if you make one big stack and slice them all at once. Using a pizza cutter, cut the dough in half, then each piece in half again, and all of those in half again- voila- you have 8 strips! Spread 1 tablespoon of marinara over each pizza dough strip, top that with the quartered pepperoni, and then finish with a sprinkle of cheese. 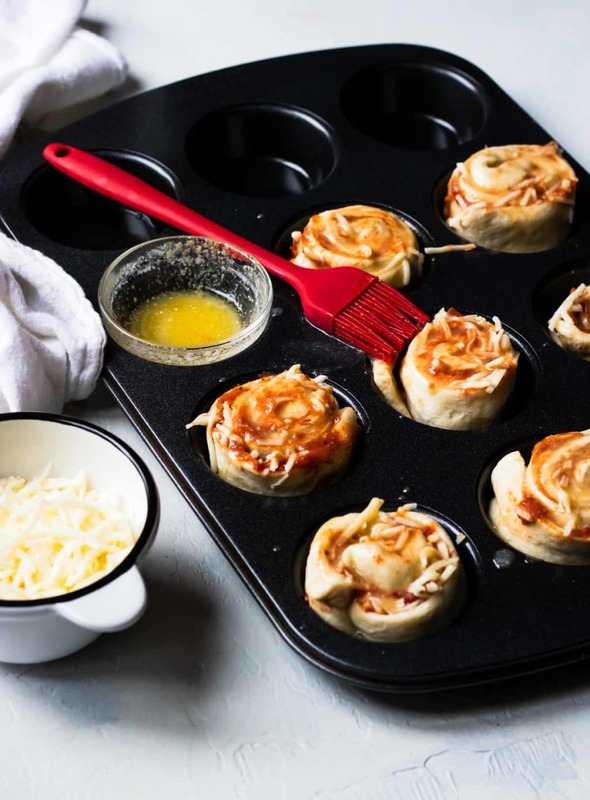 Roll each dough strip up, like a cinnamon roll, and place it in a greased cupcake pan. Now melt the butter and mix in the garlic powder. Brush that mixture onto the tops of each pizza roll up. Bake for 15 minutes at 400 degrees. You will want to let them cool for about 5 minutes before digging in! What Do You Dip Pizza Roll In? Are you sick of making peanut butter and jelly sandwiches yet!? Need a new sack lunch idea that your kids will actually eat, and LOVE!? 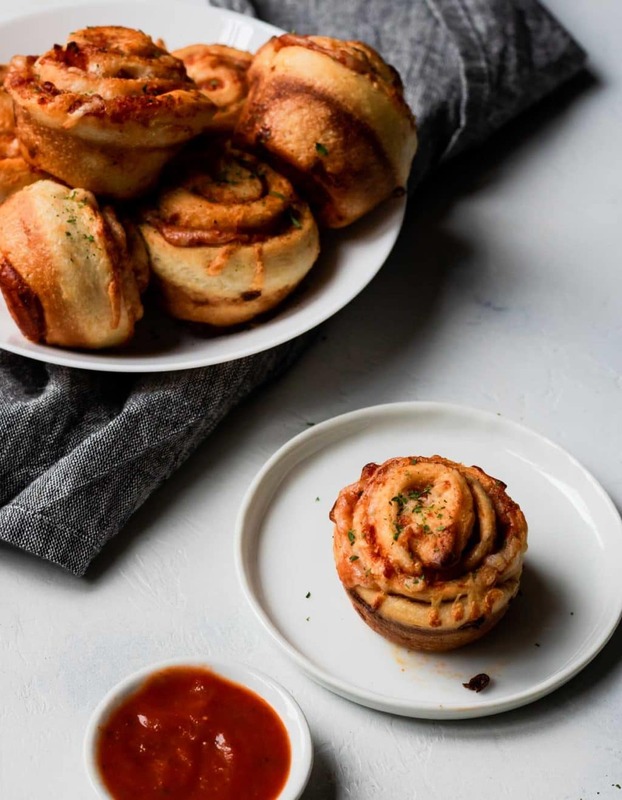 These Pizza Pinwheels make the perfect sack lunch for kids. Make them over the weekend, store them in the fridge, and then on Monday pop one or two in your kids sack lunch, add a drink, some fruit and veggies and lunch is packed! 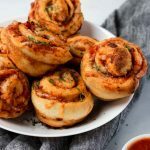 This recipe for Pizza Roll Ups would also make a great appetizer for a cocktail party, Italian dinner, or kids party. I would just make them a little smaller by slicing the pizza dough into 10-12 strips. That will make perfectly bite sized pizza appetizers. I hope you give this recipe for Pizza Roll Ups a try in your kitchen. 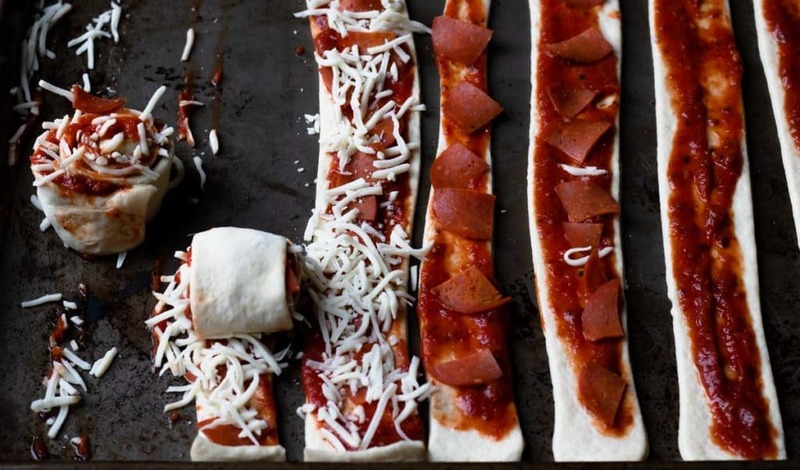 Pizza Roll Ups are an easy to make, kid friendly dinner or school lunch. They only take a few ingredients and are ready in under 30 minutes. They also make a great pizza appetizer! Preheat the oven to 400 degrees. Prep a muffin tin with non stick spray or olive oil. On a lightly floured surface roll out the pizza crust rectangle to about 14"x12". Spread 1 tbsp of marinara or pizza sauce on each strip, divide the pepperoni evenly on all 8 strips of dough, top with the mozzarella cheese. 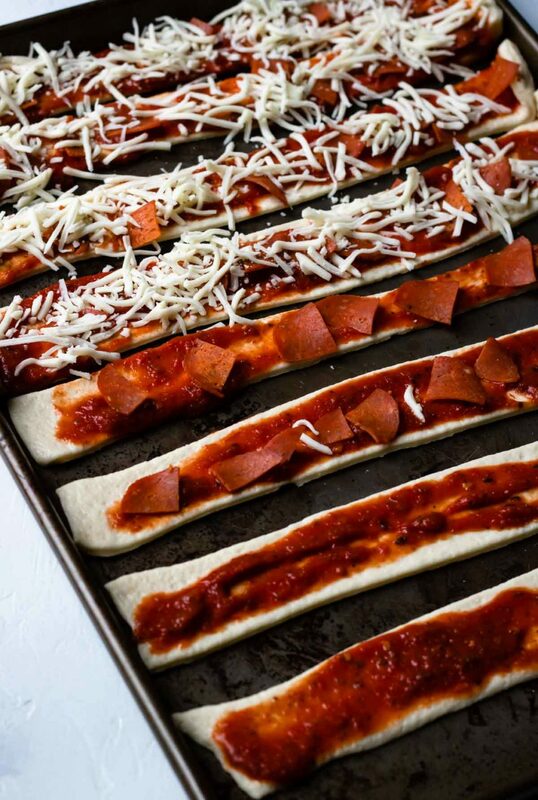 Roll the pizza dough strips up, so they look like cinnamon rolls, keeping the filling inside of the roll. Place them in the prepped muffin tin. Mix together the melted butter and garlic powder. Brush the tops of all the pizza roll ups with the garlic/butter mixture. Bake for 15 minutes, until the tops of the roll ups are golden. These make excellent lunches for the kids to take to school! These are great for kids and adults. Great idea!